By Darren Stevens in Internet. Updated on November 10, 2017 . There’s no denying that anyone who owns a blog in some way tracks the statistics and rankings of their site. After all, one has to measure growth somehow, one has to know if they’re on the right track of growth and prosperity. One way of doing this is simply to check the statistics on your site, either through an integrated tracking system, or an external one like Google Analytics. While this gives you an overview of your traffic and visitors, it doesn’t give you a picture of how your site compares to others. This is where traffic analysis services like Compete.com and Alexa come in. This article will cover the major players in the market of traffic analysis and ranking, and investigate how they operate, how and what kind of data they use to rank sites, and most importantly, their validity of their rankings. Full list at the click. Track users with custom installed software (e.g. toolbars) and record the websites they visit, then use the data collectively to estimate how popular a given website is. The main problem with this method is that toolbars aren’t popular among users, especially tech savvy users, and the data is somewhat skewed towards the kind of people who would use the toolbars (the not-so-savvy Internet users). To make matters worse, some of the toolbars only work for certain browsers, while others are even classified as spyware/malware. ISP data tracking. A more direct way is to collect vast amounts of data from ISPs and inspect what sites broadband users visit. This option is by far the most accurate, but it’s also the most limited due to privacy laws. An internal ranking score based on different metrics, e.g. 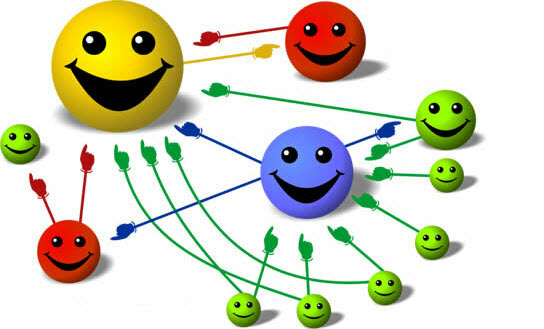 Google PageRank, which uses links and link quality to determine a site’s ranking. Most web tracking services use a combination of the first two methods, while some are entirely based around one. Here’s a rundown of the most popular services, and how they operate. Compete is a popular way of measuring traffic, and has been in operation since 2000. Compete uses traffic from users with its Compete Search bar installed to rank sites and estimate traffic, in addition to data from ISPs and other metrics. Compete also offers several paid services, including search analytics that compares site keywords. Like any traffic service, Compete.com’s rankings are as trustworthy as the data they have, which in their case is compiled from several sources, including a toolbar, data from ISPs, and online surveys. Because data is compiled and estimated from several sources, it’s prone to be less biased than if it was compiled from only one source, e.g. a toolbar. Alexa, founded back in 1996, and now owned by Amazon, gathers data from only one source: its toolbar for Internet Explorer and plugins for Firefox and Google Chrome, and the ranks of website are calculated on a 3-month basis. Throughout these years it has become so popular that many advertisers and webmasters use it to estimate traffic. As Alexa ranks websites based on only one data source, it is often cited as vastly inaccurate compared to other tracking services, and rightfully so. Alexa only uses one source of data, and that data is entirely based on whether the user has a toolbar installed, but some anti-virus applications even classify the Alexa toolbar as malware. Finally, Alexa ranks are calculated on a 3-month basis, which is a relatively long time, especially in a fast growing online world. Despite all this, Alexa is used by many bloggers to rank sites, and is popular among advertisers to estimate traffic of websites. 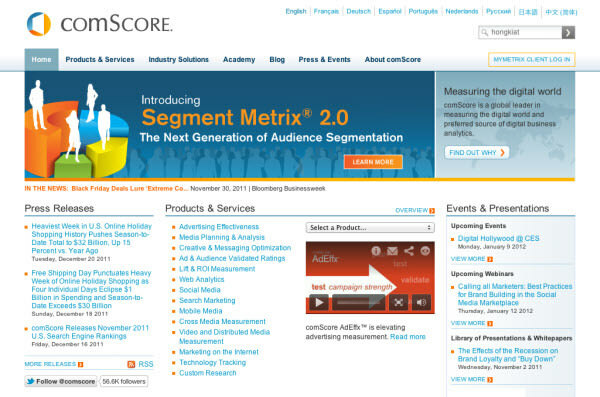 comScore gathers data from a selected group of users who have comScore monitoring software installed on their systems, which tracks their website visits and activity. So far, over 2 million people send data to comScore, which uses it to create traffic rankings and estimates for marketing purposes (e.g. selling the data to large advertisers and researchers). Though its rankings and data are commercially available only, it’s popular among advertising agencies and online market researchers. comScore handpicks its users based on age, location, income, etc., which gives it a broad representation of web traffic and demographics, something other traffic ranking services don’t. Because of the expensive way in which the data is gathered, comScore’s traffic and rankings aren’t publicly available besides a top 100 list. Users, and marketers alike, have to pay for the data. What you get though, is of high quality. 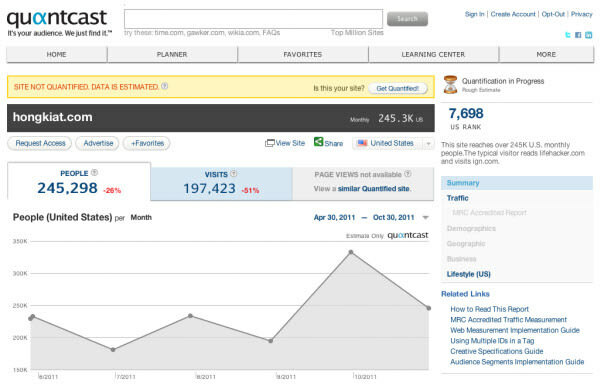 Quantcast is one of the newer players in the market, and has been active since 2006. It gathers data from website owners who insert a code snippet into their HTML code, sending visitor data to Quantcast. The service only tracks US visitors for the time being. Quantcast tracks data directly from sites, and what makes it different than others is it can only compare sites that are both participating in the system, but it’s still somewhat of a “niche” service. Google Trends is a service offered by search giant Google, which displays and ranks a particular search term compared to the overall volume of search. It’s also possible to compare several search terms against each other, and display the data from a period of a number of years. Additionally, the data can be narrowed down to country, city, language etc. As you might know, Google Trends’ data is based on Google searches. It’s used to view the volume of searches for a particular item, or compare several items, which makes it a great tool for research purpose. 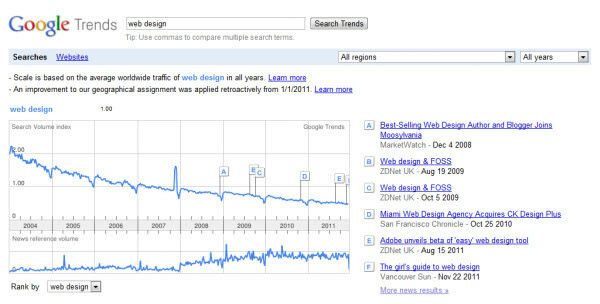 Google Trends can be used in a number of ways, for example, to compare how often a phrase is searched. 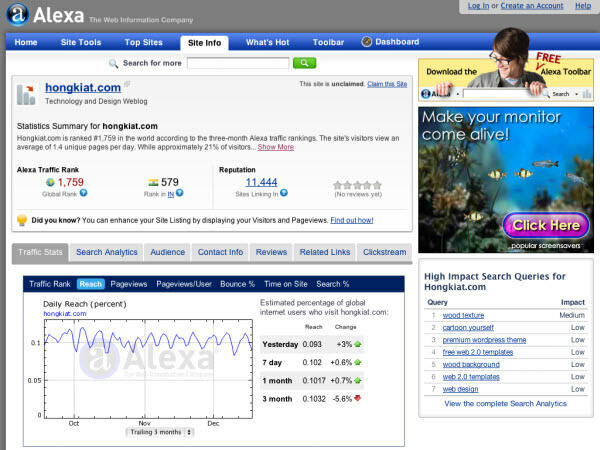 It can also be used to compare different sites, e.g. Engadget vs. Gizmodo over time, or in different regions (e.g. the US). PageRank, developed by Larry Page for Google in the late 1990s, is an algorithm for ranking websites in Google’s search engine. It uses data based on how websites link each other to create a ranking from 0-10. It’s widely known that PageRank is used internally by Google, and it’s a popular standard of measuring a site’s importance on the web. Overall it’s updated 1-2 times a year, and the ranking algorithm is changed within certain time. The whole search engine optimization (SEO) industry has been built around to optimize the site’s PageRank. Google uses PageRank as of its key measures to determine search engine results, and sites with a high page rank (6+) are considered “influential”. PageRank isn’t generally used to estimate site traffic, since it doesn’t rank websites based on traffic, but rather, based on the site’s importance. But that doesn’t mean PageRank isn’t useful – it’s still one of the most popular ways of determining a site’s genuine popularity. Should I be worried about my rankings? Should I even care? Well, the use of web traffic estimators and ranking services isn’t necessary to any site owner – most have some form of stats tracking like Analytics installed, and for the most part, that’s all that matters. But there are situations where your ranking on one of these services matters. For instance, potential advertisers will glance at your rankings in order to estimate what kind of traffic your site gets and estimate your site’s importance. Alexa rankings, for instance, regardless of their usefulness, are still used to gauge website popularity by advertising services such as BuySellAds. Technically speaking, these services don’t matter to the individual site owner, but they matter to those (e.g. advertisers) who compare properties and decide where to put their money, especially those media companies looking to acquire sites. Even if the data isn’t nearly as accurate as it should be, most times, these services are all that’s available to measure one site against another.